Cape Hatteras is a beautiful, thin and small island situated in an extraordinary place in North Carolina. In Hatteras, you can truly relax. If it's windy, you go kiting. If it's not, you can go surfing and on the rare no wind or wave day you can go biking, suping, jetski tours or relax at the beach. Year round, Cape Hatteras sees winds from around the clock as far as direction is concerned. This is ok since Cape Hatteras is 35 miles away from the mainland and any wind obstructions, making any wind direction a clean and steady wind to kite in. It is the steadiest wind I have experienced in a while! Generally, spring sees a good mix of SW and NE winds with some NW and northerly winds. Summer sees the NE die out and the SW take all the glory, with a few S and SE showing up in August and September. Fall winds show the SW fading away, replaced by NW, N and NE. Winter sees a pretty even mix of every direction on the compass with northerly winds being cooler and southerly winds being warmer. Popular spot for hitting obstacles! You need a car to get there and to get around. Easiest option: take a plane to Norfolk International Airport (ORF). Norfolk International Airport is the closest major airport. It’s about a two-hour drive from REAL. It’s a major airport serving coastal Virginia as well as Virginia’s Eastern Shore, northeast North Carolina and the Outer Banks. Air service is provided by American, Continental, Delta, Southwest, United Express and US Airways offering access to hundreds of cities. Car rentals are available from the airport from all of the major providers. Renting a car is the most cost effective and practical way to get here and get around. If renting a car isn’t an option for you, there is also an airport shuttle that can drive you to Cape Hatteras. Butter flat sessions for days! The Dare County Regional Airport (MQI) is 30 minutes away from REAL and accepts most size private planes and jets. They offer fueling and charter services, and Enterprise Rental cars are available for pick up at MQI. Other nearby airports include Newport News, Virginia (PHF) and Raleigh-Durham, North Carolina (RDU). You have quite some good selection of food in the OBX, Watermen's Bar and Grill is my favourite. The menu is just insane. You can drink the tap water. Hatteras is quite chilled unless you come for Triple S Invitational. Events are here and there, but it is more of a place to chill. The internet here is excellent and will have you covered for most things. Julia showing her love for this spot! The usual thing in OBX is to rent a house in between a bunch of people. Also, you can stay at Real Watersports. Julia is a kitesurfer from Fuerteventura riding for North Kiteboarding. After her shoulder injury she decided to spend her winter in The Philippines and she visited some amazing spots she decided to share with us. Her best result was Vice European Junior Champion in 2013 and she also did some world tour stops where she got 9th place. Been to Cape Hatteras? What did you think? Where are the Best Kitesurfing Beaches in Cape Hatteras? Cape Hatteras is a huge flat water lagoon perfect for kiting. Most of the entries are private path's, but you'll find your way to the water through Real Slick. Waves: On the outside of the lagoon. Shorebreak: Not inside the lagoon. When is the Best Time to go Kitesurfing in Cape Hatteras? 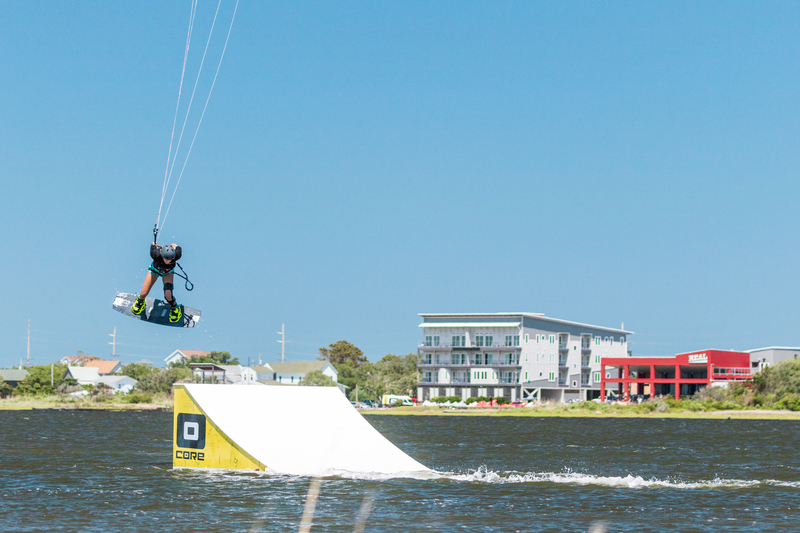 Aaron Hadlow and Laci Kobulsky have been working on a new feature-length film called TWENTY, in this issues instalment, they tell us what went down in Cape Hatteras for the Park Section of the movie! Ryan Osmond took a chance, ditched his tedious job, and followed his dreams. Now, his backyard is the REAL Watersports slick, and his day-to-day has him creating photos and videos with the best riders in the sport. Get to know this British/American media producer who is equal parts talent, dedication and hard work. OBX vs Lake Erie: How good can lake surfing really be? Few clips from 2017 Wind Voyager Triple-S Invitational! Karolina Winkowska is loving it out there. Thank you REAL Watersports for the awesome week!